Warning- This post contains violent, comic book images rendered in stuffie form. Just thought you should know in case you're squeamish about that sort of thing. This is my little brother. Not Tommy, the one I've mentioned before, but his twin, Matthew. 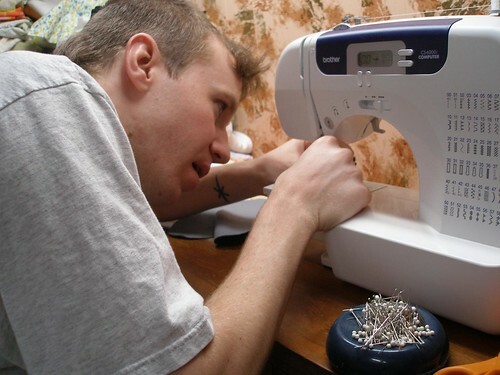 In this picture, he is using my sewing machine to make a birthday present for his girlfriend's daughter, Raven. Raven loves a comic book that, frankly, scares the crap out of me. It's called Johnny the Homicidal Maniac and was created by Jhonen Vasquex Vasquez, the same guy who did Invader Zim. If it strikes you as odd that a kid who could write such beautiful and tear-jerking poetry would also love such a twisted story, it shouldn't. Raven is bizarrely creative. And that's what we love most about her. I once watched her play a song using our wall as an instrument. So without further ado, may I introduce you to Nailbunny, complete with abdomen hole and removable nail. Click here for a ginormous version of the picture to see this guy up close and check out the awesome nail channel that I helped Matthew engineer. And I'm not sure who is top of the weirdo list for this post, the kid who loves a comic book with a dead bunny nailed to the wall (and who also happens to be a vegetarian because cows and pigs are cute) or the grown man who decided that a dead bunny nailed to the wall would make the perfect stuffed animal for a 12 year old girl. I guess you can decide for yourself. 2. 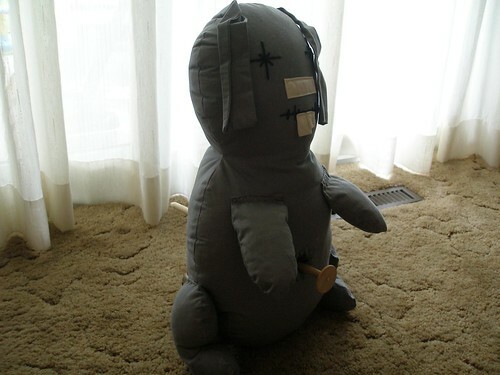 That is one seriously well-made, albeit creepy, bunny. 3. I read the poem and Wow! Writer, she is! This may be the first twelve year old in Creation who I like. Bizarrely creative is a great way to go through life. Now go love that Nailbunny! I honestly am speechless. Not in a bad, disapproving way, but in a puzzled, what the ...? way. I've only this year begun finally embracing the idea of the sponge bobs, chowders and flapjacks of the world, and now you're telling me that there's a homicidal maniac named johnny, and a nailbunny with a removable abdominal nail? I lead such a sheltered life. What a great bunny! Are you going to share how you engineered that nail hole? Because seriously - that's great! What a great and thoughtful guy he must be. P.S. You spelled Jhonen's last name wrong. P.P.S. But maybe that's how to spell his alien name. Weirdo, thanks for the catch. It is now fixed. 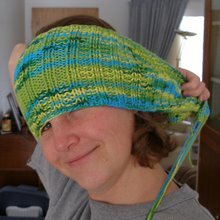 Would you be available to hire for proofreading my posts? Cause that sort of thing happens way too much.